蟠龙山Panlong Shan (Coiling Dragon mountain) are the mountains to the east of 燕山脉Yanshan mountain range. 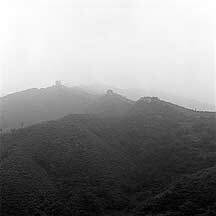 On its spine, stretching 5 kilometers, is the battered 蟠龙山长城Panglongshan Great Wall. Because this section of the Wall had hosted a great number of intense battles, especially during the 民国Republican Era (1912 - 1949), much of the structure is now in ruins. The most violent of these exchanges occurred in the 1930's, when the Japanese army aggressively entered China in the midst of China's civil war. Setting the events in motion was Japan's invasion of northeast China's Manchuria, where they set up a puppet government to run it as a state called Manchukuo (Japanese pronounciation of Chinese characters,满清国Manqingguo (Manchuria). Manuchuria became a stepping stone for Japan's further invasion into China's interior. The capital city, which is about 100 kilometers south, was the logical target. So in 1933, Japanese troops moved down toward 北京Beijing. 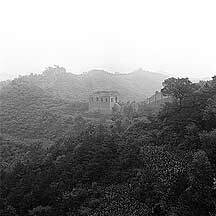 From there to Beijing they must pass through 古北口Gubeikou, a strategic narrow pass through the Yanshan mountains. There, in march 12 of the same year, they met resistance. 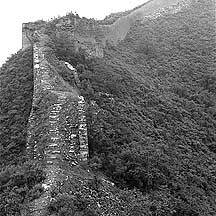 Of Gubeikou's Great Wall, the Panlongshan section is the closest and the lowest; conseqently, much of the fighting was concentrated along there. This luckless Wall received blows of all kinds - cannon balls, tank shells, and heavy artillery from planes and on grounds. Since then none of the section had been restored, at least none that I had seen while I was making my way from Panlongshan toward 司马台Simatai; so, anyone who hikes the Panlongshan Wall can still see the damages done by war machines. Some towers are designed with a hole on the ceiling where only a rope ladder were used to reach up. The constant and persistent force of time and nature did more damage than hordes of invaders. This deteoriating tower is a reminder of the speechless tragedy that nature brings on all things and humans on themselves through vanity. But being what humans we are we cannot help taking this as an opportunity for great adventures and grand reflections. Much of the Wall here are in ruins. Hundreds of years of neglect had blurred it and rendered it an object with all types of associations, poetic or otherwise. This is very likely an abandon well. I walk on top of the Wall whenever I cannot wall along its foot. Either way there are safety concerns, so judge for yourself: the top of the Wall may be weak and can collapse; and the narrow path on its foot may be slippery and narrow, an unfortunate fall can send you down the hill. The Wall may look a little steep, but it was not so bad. With the fresh air and the endless view of green mountains I didn't really think of physically tireness. Plus there was really no where to go but forward. There are side stairs up the wall. Needless to say, they are on the Chinese side. The mountains are claiming the Wall as its own, so the vegetation had extended to its peak. It is amusing to see the tree topping the tower, like a large flower pot. Once a while I see a tree stand out. It is not difficult to spot someone far away. One of the large grand two-story towers. After spending much of yesterday looking for a path up the Wall, I gave up and decided to climb the nearby 卧虎山长城Wohu Shan Wall, which is the section of the Great Wall that winds through the western part of the 燕山Yanshan (Yan Mountains). 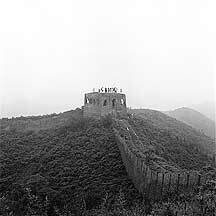 The next morning, my guesthouse owner, Mr. Pang, showed me up the Panlongshan Wall, and there I set out toward east at 8:20 in the morning. I reached my first tower an hour later; then climbed the grand 将军楼General's Tower at 10:45. By one in the afternoon, I had reached the twenty-fourth tower — the end of this Wall; ahead is the sealed section of the 五里陀长城Wulituo Great Wall use by the military. 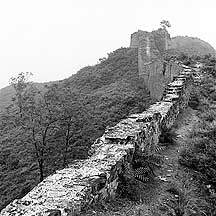 From beginning to end, the Wall was either crumbled and bare or covered with vegetation; even trees were grown on it. Much of the top had been levelled, and in many areas had been filed to its base — by the powers of nature and gunpowder. Its protective parapets were all gone — like a dragon without its scales. And its brick skin had also fallen off, sometimes in a single large sheet; all that is remaining is the rammed earth core with the filled stones. These embedded stones and rocks can be very sharp — so watch out. Parallel to the Wall, and along its base, is sometimes a narrow footpath; so, when the Wall is impossible to walk along on its top or when it is not safe to do so, the footpath should be used and vice-versa. To prevent further stress to the Wall, use the footpath whenever possible. I passed much of the Wall quickly, mainly because it started drizzling, but also because I did not bring enough food and water for a night here. My bag was already a quarter of my weight and my tripod was an extra burden. Fortunately, this part of the Wall was not difficult to walk because the hills in this area have mostly low curves and shallow valleys. But at some sections I had to climb on all fours, which was clumsy as I had only one free hand. Meanwhile the rain came on and off, so I was a little wet. At times I wish I can hide, but the towers were all roofless and crumbled. One of the unforgetable experiences on the Wall is the enhance awareness of the surrounding. There is a distinct advantage being on a higher plane — anything below, even several mountains away, can be easily spotted. So too are the sounds, which I can hear long before I can see the object producing it. At he height of its glory, the Wall was certainly a speedway that moved traffic swiftly and efficiently through the mountains. Today it lay in ruins and with no traffic. For hours I only hear the chronic echoing shrills of wild birds. But none appeared in the wide green rolling hills. Nor was there houses or smoke in the distance. Then a fog hovered in the distance, and it was building up rapidly. As I was near the General's Tower I heard sounds of people. I was about two hills away when tiny dots appeared moving up the tower. These turned out to be young Beijing natives who had just hiked here from the nearby ticket entrance. Following them were two Great Wall staffs, and of course I had to buy the ticket from them. They can be identified by the gray pin on their shirts with a number. From 北京市Beijing city's 东直门汽车站Dongzhimen's bus station, take the bus to 密云县Miyun county. From the county, take a minivan to Panlongshan Great Wall or to 古北口镇Gubeikou town. I did not go by this way, but there is really only one road through this area. The Panlongshan tourist entrance (on the east side of the road) and Gubeikou town is right beside the 101 national highway, connecting Beijing city and 承德Chengde. So any bus to Chengde will also pass by its door. As I did not start from the main tourist entrance to the Panlongshan Wall, I do not know the area. But like many popular attractions, there should be plenty of guesthouses in the area. I don't know if Gubeikou town extents to Panlongshan, but he town I visited is not far north of here and it has plenty of guesthouses. Getting to the town is easy as there are plenty of buses and minivans going this direction. 25 yuan. 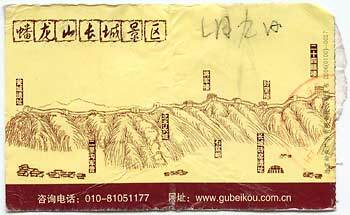 (summer 2006) On the ticket is an illustration of the Wall with the names of its major towers (the vertical blocks of characters). Alot of the Wall is in deterioration and many parts had crumbled. Add to this, the Wall is overgrown with vegetation. So be prepare.